Produced using virgin vegetable oils (extracted by cold pressing) rich in vitamins and essential fatty acids, and essential oils which respect strict quality standards, AGAT’HE synergies are suitable for use by the general public and professionals. These massage and beauty oils are a ‘therapeutic supplement’, ensuring a high quality cosmetic treatment. 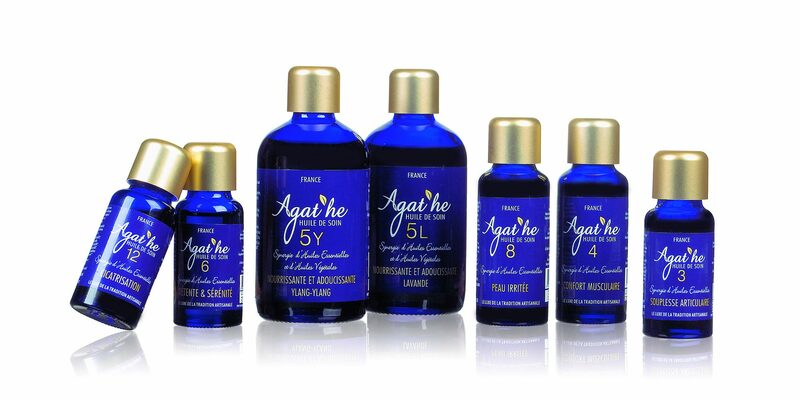 Discover the AGAT’HE range on the website agathe-aromatherapy.com or agathe-essential-oils.com. The diffusion of essential oils involves dispersing a mist of active potentially anti-bacterial, anti-viral and immunostimulating molecules in the form of micro oil droplets, with the aim of purifying a room’s atmosphere. The choice of which essential oils to mix is important to ensure that the oils interact intelligently in synergy. The flagship product of the range is the food odour powder which you put in your shoes. When you are wearing shoes your feet can not breathe freely. They suffer and sweat. Sweat is one of the ways by which the body controls its temperature. The amount of sweat can vary considerably from one person to another and can at times be excessive. This is called hyperhydrosis. This excessive sweating can occur even without high temperatures or physical exercise. Normally the sweat does not smell. When it is decomposed by bacteria in your shoes, however, this can cause a bad, at times sickening, smell. Pedicool combines rosemary and lavender essential oils which working in synergy prevent decomposition by bacteria and absorb humidity which builds up in the shoes and the soles. This puts an end to your shoes and feet smelling bad. – Foot bath powder containing mint essential oil which relaxes and refreshes. – Massage oil to alleviate heavy legs. This range which is currently being developed is composed of products which contain only 100% organic substances.